Whether you realize it or not, this Christmas season you are very dependent upon the Council of Chalcedon if you are a Biblical Christian. I do not mean to say or imply that the doctrine of Christ’s incarnation is not clearly contained and defined in the Word of God. Quite the opposite, the virgin birth of Jesus, the incarnation of the eternal Son of God and Christ being like us in 100% true humanity are all doctrines clearly articulated in the Word of God. Yet, clearly the early church struggled to articulate this as views arouse that were not in keeping with the truth of Scripture. How is it that God became human? How does the humanity and deity come together? The early church struggled with some of the articulation of this as church fathers debated against aberrant views. In 451 AD it became necessary for a church council. The Council of Nicea (325AD) and Constantinople (381AD) had already clarified the Bible’s teaching for the whole church that Jesus Christ was truly God and equal with the Father. But in the next century the issue of how Christ’s deity united with His humanity became the crucial issue. As one scholar writes “Chalcedon is the place in ‘the history of Christian thought where the New Testament compound was explicated in exact balance so as to discourage the four favorite was by which the divine and human ‘energies’ of the Christ event are commonly misconstrued.’” (John Leith, Creeds of the Churches, p. 35, quoting Albert Outlier). Every time you and I reflect this Christmas season on how the Word became flesh and that Jesus was truly God and truly man, we are indebted not only to the Word of God but also the Council of Chalcedon. When you and I come to Christmas, we need to remember who Jesus is (the Son of God) and what he became in the fullness of time (truly human). But how does the divine nature and the human nature come together? The Bible is clear in its teaching Jesus is truly God. He always was and is truly God. So whatever Jesus does in the act of His coming, we need to be clear that He does not set aside His nature, divine attributes, or divinity. He cannot be truly God, who is unchanging, if He can take deity off like a coat. But equally true, Jesus cannot truly redeem us if He does not assume our nature. I believe it was one of the Cappodocian Fathers who said “What is not assumed cannot be healed.” Therefore, as Hebrews teaches us, He had to become like us in all things. He had to take on 100% of human nature, yet of course he was without sin since sin was not intrinsic to human nature as God created it. But how does the divine and human come together? Is Jesus a sort of God-man hybrid? Is he a third thing, a tertium quid? Is Jesus being the God-man sort of a Jewish Hercules? When I was teaching as a youth pastor, on occasion I would say “Jesus Christ is not Chocolate Milk.” When you mix chocolate syrup (and please use quality stuff like Hershey’s Chocolate Syrup) with milk you get a new product. The chocolate milk contains chocolate and it contains milk. But because of the mixture it is neither pure or fully chocolate, nor is it any longer pure or fully milk. It is a third thing--a tertium quid. When the divine nature and the human nature come together in the person of Jesus, Jesus Christ is not chocolate millk, i.e. a tertium quid. IF he was then he'd be not quite fully human and not quite fully divine, but a combination. 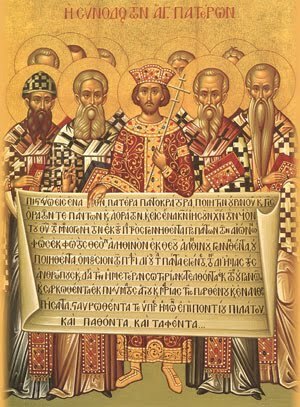 Enter the doctrine that is crucial for Christmas: the hypostatic union. When the divine and human nature unite in the person of Jesus Christ each retains fully all of its characteristics, properties and attributes. There is no mixture of the two nor degradation of either one. There is a union of the two so that both come together without any changing of attributes or ‘watering down’ of characteristics. Christ’s humanity is not “added to" because He also is divine. Nor is His deity reduced as if humanity somehow dilutes His divinity. When you think of Jesus in the manager, you are to believe that He was at that moment truly God--upholding the world by the word of His mighty power. But at that same moment He was also truly man being held in His mother’s arms, consenting to be weak in His humanity. The one who was sustaining creation in His deity at the same moment needed in the humanity that He took on to be sustained by His mother’s milk. This is a tremendous mystery, but it is what the Bible portrays. It is also a cause for great worship, marveling and standing at awe before the one who is truly God and truly man. It truly makes Christmas worthy of celebration. This Christmas, as you think of these truth, you are indebted to Chalcedon. We, then, following the holy Fathers, all with one consent, teach men to confess one and the same Son, our Lord Jesus Christ, the same perfect in Godhead and also perfect in manhood; truly God and truly man, of a reasonable (rational) soul and body; consubstantial (coessential) with the Father according to the Godhead, and consubstantial with us according to the Manhood; in all things like unto us, without sin; begotten before all ages of the Father according to the Godhead, and in these latter days, for us and for our salvation, born of the Virgin Mary, the Mother of God, according to the Manhood; one and the same Christ, Son, Lord, Only-begotten, to be acknowledged in two natures, inconfusedly, unchangeably, indivisibly, inseparably; the distinction of natures being by no means taken away by the union, but rather of the property of each nature being preserved, and concurring in one Person and one Subsistence, not parted or divided into two persons, but one and the same Son, and only begotten, God, the Word the Lord Jesus Christ; as the prophets from the beginning (have declared) concerning him, and the Lord Jesus Christ himself has taught us, and the Creed of the holy Fathers has handed down to us. I for one am very thankful for the conciseness and clarity of these words. While I submit the Creed to the authority of Scripture, I find that this crystalizes and succinctly states that which the Scripture portray. My Christmas reflections into the Word of God and the marvelous acts of that first Christmas are guided and guarded by the words of Chalcedon. It means something powerful to say that Jesus was truly God yet He assumed true humanity. Praise the Lord, his deity was not diminished. When we sing the words “veiled in flesh the Godhead see, hail incarnate deity,” we readily know and understand that it was an assumption of true humanity. To see Jesus was to see the glory of God. When you sing carols with words like this, whether or not you know it you are indebted to Chalcedon. Chalcedon is of course itself indebted to Scripture. The wondrous mystery of God incarnate is why the angels appear to the Shepherds and praise God. This is why the Magi bring gifts and bow before the King. Chalcedon’s Creed is a powerful reflection on the meaning of Christmas.